Using a rain barrel is an environmentally friendly water-saving solution. For many of us, it’s also very friendly on the wallet, as municipal water can be extremely expensive, and can be restricted or banned during times of drought by local governments. For this reason, rain barrels are a great solution to protect water quality and keep plants wet even in tough conditions. But the setup of a rain barrel can be complex, and a rainwater diverter is almost always required. After a thorough examination of several diverter systems, we have determined that the Best Rain Barrel Diverter is the Great America Save the Rain Diverter system [Amazon Link]. The Save the Rain Diverter has two sizes, one for 2″ x 3″ downspouts, and one for 3″ x 4″ downspouts. It routes 100% of rainwater to the barrel when enabled, and can be shut to completely bypass the rain barrel and run only down the downspout. Installation is pretty easy and assuming your barrel has an overflow protection system, it is a great choice. For a complete review of the Great America Save the Rain Diverter System, see below. If you haven’t purchased your rain barrel yet, have 3″ x 4″ gutters, and you subscribe to the DIY ethos, the EarthMinded Rain Barrel Diverter and Rain Barrel Kit [Amazon Link] is a really great system that provides everything you need for a rain barrel diverter and all the parts necessary to convert any sealed plastic drum into a DIY rain barrel! This is a well put together package and is a surprisingly functional system. If you already have your barrel, don’t have 3″ x 4″ gutters, or don’t like DIY, then this kit is probably not for you. For a complete review of this rain barrel diverter kit, see below. If you’re trying to keep the price down, but still need a downspout diverter, the Oatey 14209 Mystic Downspout Diverter [Amazon Link] is a good choice with easy installation and fairly high functionality. It doesn’t divert all the water coming down the downspout, but it captures quite a bit and is pretty effective. The PVC tubing included is not very good, and you may want to pick up some additional tubing from a home improvement store for better quality. For a complete review of this downspout diverter, see our product reviews section below. In this section, we will look closely at five of the top rainwater diverter products available in the marketplace. We will identify what circumstances work best for each diverter, and identify our favorites. If you haven’t picked your rain barrel yet, be sure to check out our article on the Best Rain Barrels to find the one that’s right for you! The Gardener’s Supply Company downspout diverter is a simple plastic add-on that attaches to a standard metal downspout. When it rains, the diverter directs the flow of water into a rain barrel or other receptacle. When that barrel is full, the Gardener’s Supply diverter automatically routes water back to the downspout to prevent overflow. The Gardeners Supply downspout diverter works pretty well and is easily installed into a standard downspout. As long as you have a power drill, you won’t have any issues getting this installed, and the included hose routes water directly from your downspout the rain barrel of your choice. Buyers should note that if your rain barrel does not have a linking hole for a hose, there are instructions on how to drill and install the hose. One issue with this diverter is that it significantly restricts the flow of the downspout, and during heavy rains or winter melts, can cause issues with overflow, icicles, and the like. Be sure to monitor the downspout that is connected to the Gardener’s Supply diverter to ensure that it is functioning properly. The Gardener’s Supply downspout diverter is an effective diverter. The restricted flow of this diverter during winter time is a downer, and could conceivably cause problems with your downspouts, so be wary during times of melting. The fact that this unit is available in two colors is nice, and assuming your rain barrel has an inlet hole, or you’re willing to drill one into your barrel, this is a good choice for a diverter. Overall this isn’t a bad choice, but we feel there are better options on our list. 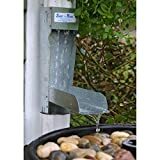 Fits standard downspouts up to 3-1/4" by 4-1/4"
The Great America Save the Rain Water Metal Diverter is an interesting design for a rain barrel diverter. It essentially is inserted into the downspout, and when active, automatically reroutes water from the downspout into a rain barrel positioned a short distance away. The Save the Rain Water Metal Diverter is a pretty simple mechanism and is easily installed in either 2″ x 3″ downspouts, or 3″ x 4″ downspouts, depending on the size chosen. Essentially this diverter can be closed, in which case it is bypassed and works as a normal downspout, or open, in which case rainwater is channeled to a rain barrel located in close proximity to the downspout. When opened, the diverter channel is about 7″ from the downspout. If your rain barrel opening is more than 7″ from the edge of the barrel, you can position this diverter a little higher up on the downspout, so that water will spill out far enough to hit the rain barrel where you need. There is no mechanism on the Save the Rain Water diverter to stop a rain barrel from being overfilled, however, most rain barrels have an overflow spigot tied to a hose, which presumably will handle the overflow. If your rain barrel does not have any overflow protection, you may want to pick up a different diverter like the Gardener’s Supply diverter above. The Great America Save the Rain Diverter system is a great choice for many and is our top pick among rainwater diverters. Assuming your rain barrel has an overflow port, this diverter is ideal. It can send essentially 100% of the water into the rain barrel when opened, and when closed, routes 100% of water down the downspout, as normal. It is easy to use and extremely functional. This system will fit both 2″ x 3″ and 3″ x 4″ gutters, so no matter what you have, this solution should work well for your needs. The Oatey 14209 Mystic Rainwater collection system is a very simple rain barrel diverter with a design quite similar to the Gardener’s Supply unit described above. This fitting is made of plastic and features 4′ of hose to run from the downspout to your rain barrel. This diverter is pretty simple and is a super popular choice among diverters. There is a blocker inside the plastic downspout fitting that encourages water to run down the diverter hose as opposed to straight down the downspout. Most of the water coming down the downspout goes directly to the rain barrel, as opposed to out the downspout. If you have a sealed rain barrel, when the barrel is full, water backs up the hose and ultimately runs down the downspout automatically. If you don’t have a sealed barrel, you’ll want to ensure you have an overflow protection system on your barrel, or drill a hole and make a sealed connection. If you want to temporarily disable the diverter, a plug is included to stop flow down the flexible hose. The flexible hose is a nice extra to include, but many have found that it is… not very flexible. Fortunately, a quick trip to a home improvement store will remedy that, and the additional flexible hose is inexpensive if needed. Here is a quick video showcasing the installation of the Oatey Mystic Rainwater Collection System. This Oatey rain barrel diverter system is pretty simple, inexpensive, and effective in many cases. If you have a sealed rain barrel system and aren’t looking to get 100% of the water from your downspout into the rain barrel, it’s a good choice. However, if you really want to collect all the water possible, look elsewhere. The EarthMinded DIY Rain Barrel Diverter Kit for 3″ x 4″ downspouts is an interesting system that is much more than just a rain barrel diverter. It also includes everything necessary to create your own rain barrel from any sealed plastic barrel! If you love DIY, then the EarthMinded kit may be for you! The EarthMinded DIY Rainwater diverter kit and plastic barrel kit is a great package for those who love to get their hands dirty. This system contains everything necessary to create a rain barrel diverter, and additionally contains everything needed to take any plastic barrel, such as a trash bin or plastic barrel, and re-use the container as a rain barrel. All drill parts, gaskets, spigots, etc. are included in the package, as well as instructions on how to install the rain barrel diverter into the downspout, and how to set up the rain barrel system in any plastic barrel. When you want to disconnect everything for winter time, a plug is included to allow the downspout to function normally. However, flow in the downspout will be somewhat restricted, so be aware. If you are a fan of DIY and don’t already have a rain barrel selected, the EarthMinded rain barrel diverter is a great choice and supplies a lot of functionality at an intriguing price point. Installation of the diverter portion is really no more difficult than any of the other diverters we have examined today, and the setup of the rain barrel is also pretty simple. Certainly, a plastic trash can be modified into a rain barrel is not going to look as nice as, say, the Algreen Castilla Rain Barrel, but when it’s put together it will collect water just as well! The Inline Downspout Diverter for Rain Barrels is the classic old-school Y-shaped gutter attachment that works pretty well, is fairly easy to install, but is surprisingly expensive. These fit either 2″ x 3″ gutters or 3″ x 4″ gutters, and they come in a huge array of colors. The Inline Gutterworks system works pretty well, though in our eyes it’s about twice as expensive as it should be! This system is installed into a standard gutter (2″ x 3″ and 3″ x 4″ versions available). The Gutterworks system splits the downspout into two paths: one to the rain barrel, and one back down to the downspout and the ground. There is a lever that can adjust the flow into the barrel. It is possible to put full flow to the barrel, to put full flow to the downspout (in, say, winter time), and to put partial flow to each. There is no automatic overflow protection system, so be sure that your rain barrel has an overflow hole, and a hose running to an appropriate location. Otherwise, you may find water pooling right near the foundation of your house, where you definitely do not want it. The fact that there are seven billion colors available is nice, but buyers will immediately wonder: do I have low gloss white or high gloss white gutters? Are mine antique ivory, almond, linen, or cream? The differences are minor, and it is highly unlikely you’ll guess correctly. Unless you’re lucky, it’s probably best to just pick a color and then paint it to match the rest of your gutters once you have it. The Gutterworks diverters work quite well but are surprisingly expensive for what they are. Ultimately, several of the other downspout rainwater diverters on our list will do as good a job, or a better job, than the Gutterworks system. And they will cost less, too!